How long does it take from the time I place my order to receive the clothing? Delivery times can vary, but generally you will receive suits/sportcoats/pants within 4-6 weeks and shirts within 3-5 weeks. What is your price range for custom suits? For custom shirts? Custom suits start at $795, sport coats $595 and shirts $125. depending on the fabric and the level of handwork involved. Package pricing will allow you to get a better price for buying in multiples. Does Christopher Allen Custom Clothiers offer any kind of guarantee? We completely guarantee your satisfaction. If you are not completely satisfied with the fit of a garment we have made for you, we will fix it or remake it to your satisfaction. Do I have to be re-measured every time I place an order? Can I schedule an on site visit with your master tailor in my home or office? Absolutely. 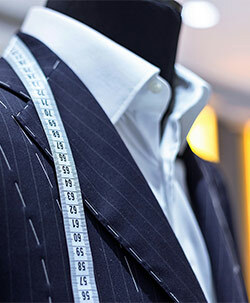 One of the most valuable services we provide is an on site tailoring service with our master tailor who can alter recent clothing purchases as well as any garments in your closet that need to be refitted, i.e… you’ve lost or gained weight. How often do you have new fabric choices? Twice per year we completely refresh our line with all new choices in each product category. Typically this corresponds with the Spring/Summer season (Jan-June) and the Fall/Winter season (July-December). We also receive fresh supplements throughout each season to keep the line full and fresh. What is the proper number of suits to have in your wardrobe? Good question—it depends a lot on how often your wear a suit. If you wear a suit everyday, a two week rotation would be a good minimum. If you wear a suit 1-2 times per week, you may be able to get by with less. What is the proper number of business shirts to have in your wardrobe? Again, this depends a lot on how often you are wearing them. If every day, a one month’s rotation (22-25) would be a nice amount, although there are plenty of people who have more and a number who have less. How often should I dry clean my suits? As little as possible. Ideally, no more than one time per quarter. Pressing your suits will take away the wrinkles as well as NOT subject your suits to all the chemicals from dry cleaning. Ultimately, too many dry cleanings will take the life out of your suits, giving them a very stiff, or lifeless, feel. What is your customization process? Our customization process allows you to choose the exact details you want for your clothing. From buttons and vents to pockets and lapels and collars and cuffs, you say how you want it and that’s how we will make it for you. Since each of our garments is made to your exact measurements, the days of searching for clothing to fit your specific body type are now a thing of the past. We use only the finest quality fabrics to create customized clothing that is sure to make you stand out in the crowd. We service business executives and professionals who are aware that you don’t have a second chance to make a first impression. Please ask about our Referral Incentive Program that can build your shirt wardrobe dramatically at NO COST to you!